American painter who exhibited with the Impressionists. Autograph Letter Signed, two pages, oblong small octavo, [Paris, May 21, 1914]. 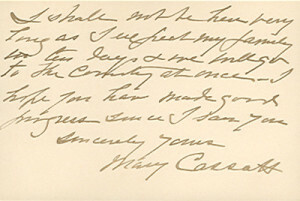 In English, on her imprinted correspondence card measuring 5 3/8 inches wide by 3 5/8 inches high, to Dear Miss Hester. With the original envelope. With success and maturity, Mary Cassatt became more diplomatic and less blunt in her opinions. She also became a role model for young American artists who sought her advice which may be the purpose of Miss Hester’s visit.